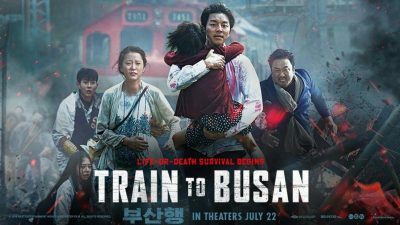 Yeon Sang-ho’s 2016’s Train to Busan is a horror film1 starring Gong Yoo, Jung Yu-mi, and Ma Dong-seok. Fund manager Seok-woo’s laudable work ethic has driven his wife away and alienated his young daughter Soo-an. No worries! It’s nothing that lavishing expensive presents on his daughter cannot fix. Except when he spaces out and buys her two identical presents. Seeing her hopeless expression as she receives his clumsy gifts, he begins to understand his neglect may have driven a wedge between them that no amount of last-minute, distracted gift-buying can fix. He can at least give Soo-an the one gift she does want, which is to send her home to her mother on the other side of Korea. Although she would prefer to make the trip alone, he insists on accompanying the ten year old on the KTX . It won’t be a happy trip but at least it should be a placid respite from his usual frantic, workaholic life. The good thing about being on a high-speed train when the zombie apocalypse begins is that none of the zombies outside the train will be able to reach the passengers. Alas, it only takes one infected person stumbling on board just before the train leaves Seoul for the infection to pervade the train. It’s only sheer luck that Seok-woo and Soo-an are not among the first victims on the express to Busan. The infection spreads like wildfire. Luckily for Seok-woo and Soo-an, while zombies are fast moving, vicious, lack any sense of self-preservation, and are single-minded in pursuit of prey, they are also stupid. They only attack what they can see and they cannot operate even simple doors. For the moment, closing the connecting doors between carriages will buy time to think of better solutions. Plan A involves disembarking at Daejeon Station (only 170 km from Seoul), where the army is waiting to guide survivors to safety. Or at least to quarantine. Alas for survivors, the plague reaches Daejeon long before the train does; the soldiers at the station are eager to make the acquaintance of Seok-wuu, Soo-an, and the rapidly shrinking number of uninfected … but it’s not to protect them. The only true refuge appears to be the train’s original destination, Busan, 200 kilometres farther down the track. At top speed, that’s only a 40 minute trip. 40 minutes, that is, assuming the tracks are not blocked. And assuming our protagonists do not find themselves stuck in a car full of zombies, zombies who are unaware (for the moment) that there are uninfected humans hiding near them…. This movie is a bit unfair to people with reasonable work ethics, people the slothful and indolence call workaholics. The same determination that sends Seok-woo off to work long hours fuels his endless effort to keep his daughter alive. Granted, from a crisis he himself helped engineer but as they say, you cannot post decent third quarter profits without sometimes triggering an apocalypse. I was impressed by how fast the infection spread. Although it’s hard to pin down an exact timeline for the movie, it seems as though the infection — which, by the way, appears to have been started by one of the companies with whom Seok-woo’s firm deals — managed to get from one side of Korea to the other in under a day. Given how quickly people succumb to bites, it’s unclear to me exactly how this could have happened. It’s not as if the zombies can drive. Nevertheless, by the time the people on the train grasp the full horror of their situation, cities all across Korea are fighting off the outbreak. Perhaps the answer is animal transmission. We learn in the very first scene of the movie that animals can be affected. All it would take is a few flocks of infected birds to spread the disease far and wide. Which means that the zombie apocalypse will be a mass extinction of the magnitude of a K/T or End Permian event. Fun all round. What made the movie work for me were the characters, most of whom (the odd businessman aside) were sympathetic. Kind folks trying to keep themselves and their loved ones alive. Even Korail employees (those who do not die immediately) do their best to protect their passengers, despite the obvious risk. Given the movie’s premise, few of the characters are likely to reach the final credits, but I thought it significant that the cowards die having achieved nothing, while the protective characters die with the satisfaction of having tried to save their loved ones. Or at least dying with them. Don’t get too attached to any particular character. You will find it increasing easy to remember the names of the survivors as the movie proceeds. That in mind, this is an engaging example of an otherwise overworked genre, one that will definitely prompt me to seek out more of Yeon Sang-ho’s work. Train to Busan is available here (Amazon). I did not find evidence that it is available from Chapters-Indigo. 1: There is an animated prequel, Seoul Station, which I have not seen. There is also a sequel slated, which is why I didn’t call this a standalone. 2: Korea’s high speed rail. There’s no obvious North American analog, because North American culture is unsuited to the creation and maintenance of high tech, high speed rail lines.